In line with our commitment to help you be the most beautiful version of you, we picked the best stretch mark cream out of almost 20 different products. The items mentioned in this roundup underwent stringent research so that we can guarantee you get nothing but the best. TriLASTIN Maternity Stretch Mark Prevention Cream is fit for expecting mothers. Loaded with 15 botanical oils and extracts, this cream can improve both elasticity and texture while protecting your skin. Cerave Intensive Stretch M﻿arks Cream is packed with a lot of potent ingredients that can get rid of those annoying streaks on your skin. It’s a great choice if you are looking for a hypoallergenic, yet effective, product to use on your sensitive skin. Safe to use during and after pregnancy, Palmer’s Cocoa Butter Formula Massage Lotion For Stretch Marks is packed with shea butter and cocoa butter to boost your skin’s elasticity. It has a non-greasy formulation and a strong cocoa scent. Burt’s Bees Mama Bee Belly Butter contains 99% natural belly butter. It’s packed with the goodness of shea butter and vitamin E your skin will surely love. Mederma Stretch Marks Therapy is good to use during your pregnancy and breastfeeding months. It contains botanical extracts that promise to give you results in just 12 weeks. If you are in your early pregnancy and want to avoid the getting stretch marks as much as possible, then it’s a good idea to invest in this product. 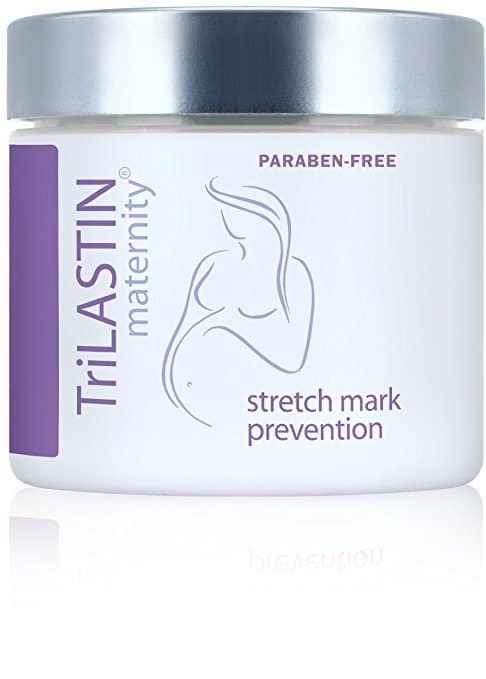 TriLASTIN Maternity Stretch Mark Prevention Cream is loaded with botanical oils and extracts to protect your skin. On top of this benefit, it also has antioxidant properties and can target uneven skin color and texture, too. You’ll love that it has a non-greasy formulation and that it doesn’t stain on clothes and fabrics. Although the product is marketed for prevention, you can still use it for fresh stretch marks. It’s ingredients make it effective in relieving itch and in improving skin resiliency and elasticity. One issue you might encounter with this cream is its scent. Despite its claim of having an unscented formula, it actually smells a bit sweet. Cerave Intensive Stretch Marks Cream contains three powerful ingredients when it comes to getting rid of stretch marks: hyaluronic acid, ceramides and argan oil. Ceramides are what fortify your skin’s barrier. Hyaluronic acid, on the other hand, seals in moisture in your skin while argan oil is what can nourish your skin. Despite the potent ingredients, it has a hypoallergenic formulation. I find it nice that it doesn’t contain fragrance, gluten or parabens you’ll normally find in other removal creams. Another plus point for this product is that aside from helping get rid of your existing stretch marks, it strengthens your skin’s barrier so you can avoid new ones from forming. As a result, you won’t only get skin that’s clear and flawless but your skin also becomes extra hydrated and soft. As for effects, I can’t really say that it can give you great results overnight but it can dramatically improve your stretch marks and skin over time. There are users of the product who saw an improvement in just a few weeks while there are some who saw changes after a full month of using the product. Palmer’s is a popular brand name when it comes to skin products and this particular lotion for stretch marks is one good reason why. It’s loaded with shea butter, cocoa butter and vitamin E to soothe your skin and boost its elasticity and suppleness. The great thing about Palmer’s Cocoa Butter Formula Massage Lotion For Stretch Marks is that it can be used during and after pregnancy. It’s best used three times a day to experienced its full benefits. Of course, you’ll have to be religious in applying it to make the product work. As for effects, there are users who experienced results in as early as two weeks. For deeper stretch marks, however, it can take more time to work. The formulation of this one is non-greasy so you won’t have to worry about feeling sticky even if you use it on several areas at the same time. I’d have to warn you that it does carry a distinct scent which can be an issue if you are having a sensitive pregnancy. It’s not an entirely bad scent but more of cocoa-like fragrance. Burt’s Bees Mama Bee Belly Butter isn’t technically a cream so don’t be surprised if it comes with a richer texture. This rich consistency makes this product great in preventing and even getting rid of stretch marks. It will leave your skin feeling soft and moisturized. I find it impressive that it has 99% natural belly butter and comes without petrolatum and parabens. It’s safe to use even on kids’ sensitive skin. A lot of women actually find this belly butter a great help. Most of them who started using it early in their pregnancy did not develop a lot of stretch marks. There were even women who noticed that their purple marks became less noticeable after religiously applying the product. Mederma Stretch Marks Therapy is best used starting at the second trimester of pregnancy to your breastfeeding period. It’s paraben-free and dermatologist recommended. What makes this product unique is its blend of ingredients. Aside from hyaluronic acid, it contains Cepalin and Centella which are botanical and plant extracts. The combination of these ingredients make the cream highly effective. In fact, the company claims that as much as 76% of women who used their product experienced a dramatic improvement in their stretch marks. This claim, however, doesn’t mean that you’ll get results from it right away. Much like with any other creams, you need patience and strict compliance with its proper use before you can see a changes in the way your stretch marks look. For best result, you should apply it twice a day until the product gets absorbed into the skin. Stretch marks are those narrow streaks and lines that form on your skin when it gets suddenly overstretched. It can be due to pregnancy, weight loss or puberty. Stretch marks aren’t harmful but they can really make you too conscious, especially when it’s time to wear those swimsuits in the summer- or that cute little dress for a dinner date. They can develop in both sexes, but girls are more prone to developing it during puberty than boys. For pregnant women, their risk of forming stretch mark increases by the 25th week of pregnancy. You can develop stretch marks around your buttocks, abdomen and thighs. You can also get them around your hip and breast areas. Stretch marks can take a lot of work and time to be completely gotten rid of. In fact, the longer and deeper you have them, the more difficult they are to remove. This, however, shouldn’t give you any reason not to try your luck. If you have fresh stretch marks, make sure to act on them early. Stretch removal creams are a convenient choice since you won’t have to visit your doctor or spa regularly for application. You just have to find the best stretch removal cream and use it to fade those annoying lines at home. Despite being convenient, you can’t rely on these creams for quick results, especially if you’re dealing with old stretch marks and lines. They, however, are good for prevention particularly among pregnant women given that they choose one that’s safe to use for their condition. Laser requires the use of beams to target the layers of your skin that has stretch marks. Compared with creams, this approach is a lot more expensive. Despite the price tag, lasers offer a more guaranteed result than creams but that will still depend on how deep your marks are. The deeper the stretch marks, the more sessions you have to take. There’s also the risk of damage to the superficial layers of your skin, especially if treatment isn’t carried out by a trained professional. If you are looking into getting your stretch marks removed through laser, I suggest you do your research first to ensure that you’re in the right hands. Surgical removal is the most invasive out of all the options but it can completely and effectively remove stretch marks. This option is generally recommended as a last resort for people who experience extreme anxiety and discomfort about the way their skin looks. Stretch marks aren’t detrimental to one’s health but it’s not a good reason to just leave them as they are- especially if you have lots of options to get rid of them. For the best stretch mark cream, we’re choosing TriLASTIN Maternity Stretch Mark Prevention Cream as our top pick. Since we believe that prevention is still better than finding cure, it’s a good idea to invest in this product, especially if you’re currently pregnant.